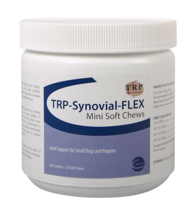 Sogeval Synovial-Flex Mini TRP Soft Chews are a comprehensive animal health product that combines Glucosamine HCl, Perna Canaliculus, MSM and Omega-3 Fatty Acids, Creatine Monohydrate and Antioxidants in a treat-like chew that dogs love. Recommended to support a dog’s healthy hip and joint function. May help alleviate the pain associated with normal daily exercise and activity.